Do Bible Students Worship C.T. Russell? For Years it has been said that Bible Students are guilty of creature worship. What is the creature they are charged with worshipping? 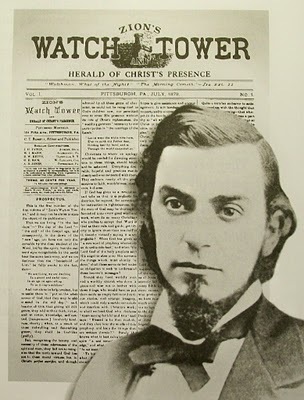 None other then Charles Taze Russell, organizer of the International Bible Students Association and founder and first president of the Watch Tower Bible and Tract Society. And who are these accusers who make such a claim? None other then the very Society Russell founded, the Watch Tower and it’s current members the Jehovah’s Witnesses. So, in essence, the Watchtower Society itself was to blame for promoting the idolizing of C.T. Russell, not a group of individuals. The Book The Finished Mystery was published by the Watchtower Society, it was sanctioned by then president J.F. Rutherford, and was the cause of much schism within the Bible Students Association, not because it was promoting Russell, but because it was filled with misquotes, half truths and perversion of thoughts. Russell did teach “that servant” to be a class, representing the church as early as 1897 in the book, The Battle of Armageddon, but some years later, would change his mind and believed it to be an individual. Yet he never claimed to be that individual. The only ones who admitted to these so-called private conversations were, Rutherford, VamAmburgh and MacMillan, the three individuals responsible for seizing control of the Watch Tower Society. Their motives behind such a promotion was to appease the close friends, colleagues and supporters of Russell. Rutherford vowed to continue the work Russell had started. But in promoting Russell, elevating him and his writings to that of equal par to the Scriptures, he created a monster. Many Bible Students parted company with the Society. Some actually believed and accepted this new idea. It was even taught through the pages of The Watch Tower that Russell was still directing the affairs of the Society from heaven. Evidently Rutherford, decided to slay the monster he created, by cunningly denouncing all he had stated and written in The Watch Tower. Not only was Russell pushed to the background, but the Scriptures had been reinterpreted. Russell’s books were left to go out of print, with no new editions being published. His name if mentioned at all, was done only in passing, as “first President” of the Society. His writings were replaced by newer ones. This cause more schisms and departures by Bible Students who could not and would not accept the Society’s leadership, and autonomous rule. For years afterwards, Bible Students and Jehovah’s Witnesses grew apart, animosity and hatred was promoted by the Society towards the independent Bible Student groups who rejected the Society as God’s Sole Channel of communication. The Society rewrote its history, omitting many important facts, and in the cases cited above distorted many events, to place them in a good light and branding Bible Students as evil opposers who would rather follow and worship a man, rather than their organization. For years, the Society shifted the blame on Professor Paul S.L. Johnson, a colleague of Russell, an ordained minister, born a Jew, who joined the Bible Students Association and became an important promoter of Bible Truths. He was the Society’s scapegoat for many years. Most of the attacks on Johnson came after his death in 1950, and continued until the 1980s, it was as the old saying goes “beating a dead horse”, as Johnson was not alive to defend himself. The Society tried to silence the Bible Students, by holding on to the copyrights of such works as Studies in the Scriptures and the Watch Tower Reprints. As Bible Students, they relied on their Bibles and nothing more. When the copyrights ran out, Paul S.L. Johnson, decided to reprint the Studies in the Scriptures. He contacted Rutherford, as they at one time were like brothers. Rutherford’s reply came in the destruction of the original plates. It was a slow process, but Johnson in 1937, made the Volumes available to the brethren. In 1940, the Dawn Bible Students Association, also reproduced the volumes. And years later, the original Watch Towers were made available to the brethren by way of the Chicago Bible Students. The Society’s publications having a much larger circulation then all the Bible Student literature combined, tried a new tactic, everytime they mentioned the term “Bible Students” they always had in parenthesis “as Jehovah’s Witnesses were then known as”. Giving the reader the thought that Bible Students and Jehovah’s Witnesses are one and the same. When people came across the name or writings of Russell or Bible Students, they would automatically associate it with the Witnesses. This however does not state that the Bible Students still exist today, it merely referred to “fragmented” groups during the schism of 1917. However the fact that you are reading this … shows that you now know … that Bible Students and Jehovah’s Witnesses are two distinct groups, with distinct beliefs. It is not so much the importance that we stress the individuality of both groups, for we do recognize the Watchtower Society, and do recognize our Jehovah’s Witness friends. But the fact that we have been misrepresented, not by Christians in general, but by the very association we helped build. It is very strange … that the Watchtower Society, forbids its members from associating with the “evil slave class”, namely the Bible Students, and have chastised those witnesses, who possess and read Russell’s writings, and at the same time, the Society has been in contact with various Bible Student groups, exchanging literature and purchasing one anothers books. This has been verified by both correspondence to and from the Society from Bible Students, as well as eye-witness accounts of Bible Student literature sitting on not only Kingdom Hall libraries, but Watchtower libraries as well. One would be apt to conclude this is a love/hate relationship on the part of the Watchtower Society. But we know the promises contained in Scriptures will not allow this relationship to continue. For one day, in God’s due time, all of mankind will learn the truth, and all will reside under His loving care. For Years it has been said that Bible Students are guilty of creature worship. That this “creature worship” led to the largest schism in Watchtower history, and separated the “Faithful Slave Class” from the “Evil Slave Class”. What is the creature they are charged with worshipping? None other then Charles Taze Russell, organizer of the International Bible Students Association and founder and first president of the Watch Tower Bible and Tract Society. And who are these accusers who make such a claim? None other then the very Society Russell founded, the Watch Tower and it’s current members the Jehovah’s Witnesses. The only ones who admitted to these so-called private conversations were, Rutherford, VanAmburgh and MacMillan, the three individuals responsible for seizing control of the Watch Tower Society. Their motives behind such a promotion was to appease the close friends, colleagues and supporters of Russell. Rutherford vowed to continue the work Russell had started. But in promoting Russell, elevating him and his writings to that of equal par to the Scriptures, he created a monster. Many Bible Students parted company with the Society. Some actually believed and accepted this new idea. It was even taught through the pages of The Watch Tower that Russell was still directing the affairs of the Society from heaven. Evidently Rutherford, decided to slay the monster he created, by cunningly denouncing all he had stated and written in The Watch Tower. Not only was Russell pushed to the background, but the Scriptures had been reinterpreted. Russell’s books were left to go out of print, with no new editions being published. His name if mentioned at all, was done only in passing, as “first President” of the Society. His writings were replaced by newer ones. This cause more schisms and departures by Bible Students who could not and would not accept the Society’s leadership, and autocratic rule. It was not so much that Bible Students “opposed” the work of the Society, the issue was the Bible Students and the Society were no longer in harmony doctrinally, the 3,000 or so who “dropped” out by 1918, eventually grew in the coming years, by 1930 seventy-five percent of the original Bible Students had abandoned the Society. What is this “truth” these Jehovah’s Witnesses claim to be “in”? it is the truth of the scriptures, the truths they learned in regards to God’s plans and purposes, the truths they learned from such works as “Studies in the Scriptures” written by the late Charles Taze Russell. Elders, Ministerial Servants, Pioneers, Bethelites and rank and file members of the Society, have been disfellowshiped because of their accepting these writings as containing truth. It is very strange … that the Watchtower Society, forbids its members from associating with the “evil slave class”, namely the Bible Students, and have chastised those witnesses, who possess and read Russell’s writings, and at the same time, the Society has been in contact with various Bible Student groups, exchanging literature and purchasing one anthers books. This is has been verified by both correspondence to and from the Society from Bible Students, as well as eye-witness accounts of Bible Student literature sitting on not only Kingdom Hall libraries, but Watchtower libraries as well. Bible Students and Jehovah’s Witnesses – What’s the Difference? The Bible Students association is the outgrowth of the events of the early nineteenth century. As you probably know, it was at that time that Bible Societies came into being. Their work of printing and distributing the Scriptures was unprecedented in both volume and geographical reach. Even those of meager means were enabled to have the Word of God. This resulted in much personal study of the Bible as well as a great deal of international Christian sharing through various publications. One area of renewed interest was the Second Coming of our Lord. This gave birth to the Second Adventist movement (not to be confused with the Seventh Day Adventist movement). At that time the Christian world largely ignored this doctrine being almost exclusively Post Millenialist in its prophetic understanding. (The churches believed they would convert the world for Christ and then He would return). Renewed study of the scriptures regarding the second coming revived the historic Reformation doctrine of pre-millenialism. Thus premillenialism is a comparatively recent phenomenon. There is a direct line of heritage through the Second Adventist leaders to Pastor Charles Taze Russell. Pastor Russell was not the founder of the Jehovah’s Witnesses. He was the founder of the Bible Students’ Associations in the 1860s. In 1879 the Watch Tower publishing house was established by Charles Taze Russell. Following his death in 1916 Joseph Rutherford forcibly seized control of the Watch Tower. He dismissed the majority of the Board of Directors, began to instill a revisionist theology and established dictatorial authority. Within the first year of his takeover one fourth of the Bible Students left Rutherford and remained true to the teachings of the late Pastor Russell. 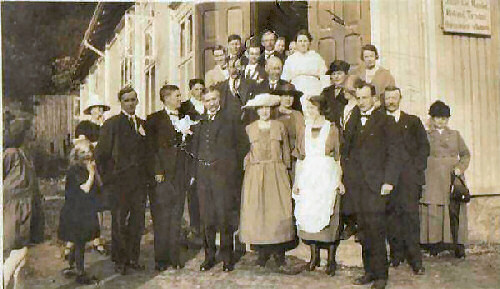 Aggressive promotions by Rutherford resulted in a large increase in new members but generated opposition from the Bible Students remaining from Pastor Russell’s era. In response to this opposition Rutherford embarked on a campaign from the years 1925 to 1931 to purge Pastor Russell’s followers. Thus, by 1931, over three quarters of those associated with the Bible Student movement in Pastor Russell’s day separated from Rutherford to remain faithful to the teachings promulgated by Charles Russell. The lineage of today’s Bible Students congregations traces back through these separatists to Pastor Russell their founder. The separation between Bible Students and Jehovah’s Witnesses was, and still is, rigidly enforced by the Watchtower leadership. Today, Jehovah’s Witnesses can read the writings of Baptists, Methodists, Catholics & etc., however, some have been excommunicated and ostracized for reading, studying and agreeing with the writings of Charles Taze Russell. Recent history has not been kind to Pastor Russell, as he is his name is synonymous with the Jehovah’s Witnesses. This, as can be seen from the above history (which is well documented), is not so – it is a well known misconception. Bible Student congregations today are autonomous. There is no central authority or publishing house. There are no membership rosters. There is no solicitation for funds. We meet as an association and strive for the organizational simplicity of the early church. We find our head or central authority in our one Lord and Master, Christ Jesus. We acknowledge that there are a few similarities of belief between Bible Students and Jehovah’s Witnesses. As well, one might speak with a Roman Catholic regarding their doctrine and then with a Presbyterian. There would be obvious similarities; but to say that the two are the same because of their obvious similarities is inaccurate. The major doctrinal difference between the Bible Students and Jehovah’s Witnesses regards the breadth of salvation. 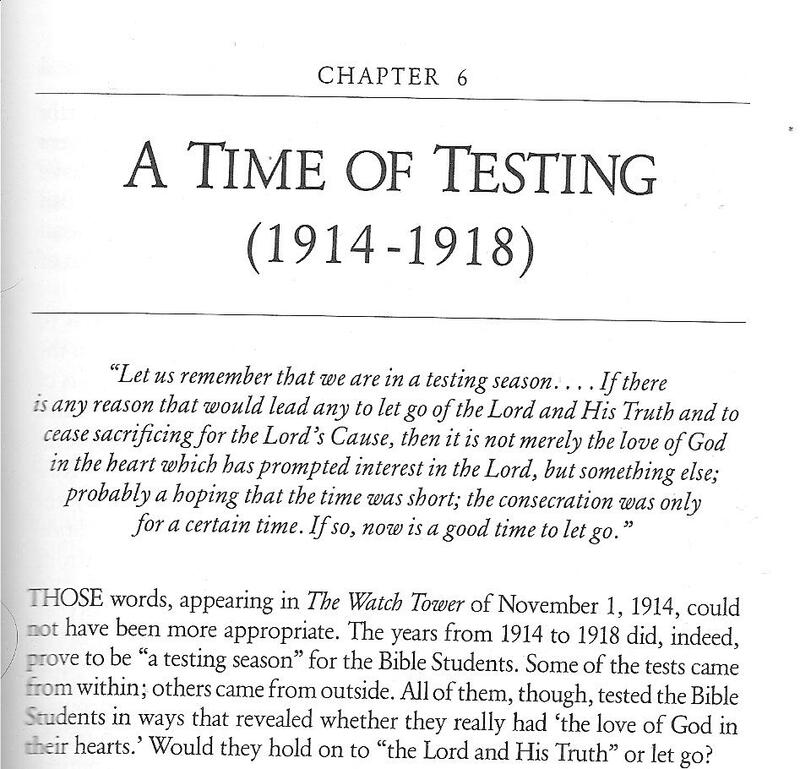 Shortly after Rutherford founded the Jehovah’s Witnesses in 1931, they developed a “narrow salvation” theology similar to that taught by evangelical Christians. Both of these groups teach that one must accept Jesus now (through the “window” of their doctrinal systems) or else be eternally lost. That means that comparatively few of the groaning billions of earth’s humanity may expect to enjoy the salvation our God has provided in His son. This places evangelical Christians and Jehovah’s Witnesses poles apart from Pastor Russell’s and the Bible Students’ “Broad Salvation” theology which will extend to all. Another major difference between Bible Students and Jehovah’s Witnesses is in regard to the Jewish People. Joseph Rutherford claimed that his Jehovah’s Witnesses replaced the Jewish people as such. All the promises of future blessing to Israel after the flesh were “confiscated” and applied to Rutherford’s organization. (Interestingly, the Jehovah’s Witnesses “Replacement Theology” follows the pattern of the Christian church’s historic anti-Semitic position regarding the Jewish People). Pastor Russell taught and the Bible Students still teach that the Jewish people have a separate and distinct destiny from the Christian Church that the Jews are still in covenant relationship with God. We are sharply criticized by both Jehovah’s Witnesses and evangelicals for our beliefs regarding the Jews which, of course, we trust are in fullest harmony with the word of God. There are many more areas of difference between the Bible Students and Jehovah’s Witnesses regarding Justification, Sanctification, Salvation, Prophecy and Christian living. Some of the differences are vast, some are subtle but important. We hope that this information is helpful to you. We realize the unfounded stigma associated with the name of Pastor Russell but choose not to delete his name from such works as THE DIVINE PLAN OF THE AGES. The message must stand on its own Scriptural merit and sometimes the Lord permits tests of association “can any good thing come out of Nazareth?” If you haven’t already done so, we hope that you will take time to read the book. It presents the Plan of God in beautiful clarity. May the Lord be with you and thank you for visiting. Below is a document that will be of interest to all interested in the events of 1917 following the death of Pastor Charles Taze Russell. For those who may question the validity of this document, we offer scanned copies of the original pages. And for those who may question that the scans are fake and that such a letter never existed, we supply a scan copy of the Januray 1, 1918 Watch Tower, where Vice President A.N. Pierson, mentions the letter. On entering the meeting room at the Bethel a week ago last Tuesday morning I was very much surprised to find that Brother Rutherford had appointed a new Board, and so expressed myself to those present. Presently we heard the reading of a letter from a Philadelphia law firm, in which were set forth the facts mentioned in the resolution read before the Bethel Family, viz., that the board of Directors, as constituted, was not a legal one, therefore its members were not legally directors. Thereupon I expressed the thought that if these brethren were not legally members of the Board of Directors — which position some of them had held for many years in the eyes of the friends in general — then the fact remains that the Watch Tower Bible and Tract Society has never had a legal Board. To this Brother Rutherford assented. I further stated that if it was true that the Society’s business had been carried on for so many years in a manner not entirely in harmony with the requirements of the law, it surely could be continued in the same way for a few more months, until another annual meeting. This was not a motion, but merely a criticism or suggestion, upon which no action was taken. You ask why I signed the resolution that was so detrimental to yourself and the other brethren. I felt that there was a measure of wrong on both sides. Some of you brethren had made statements at Philadelphia and other places which called for an explanation, and a letter of some kind was due the friends who asked for such an explanation. This resolution was drawn up by a committee, whose original intention was to have it published, to which I objected. While I admire Brother Rutherford’s ability and his wisdom in settling many difficult questions for the Society, and while I fully believe that it is the Lord’s will that he should be our President, yet I cannot approve of some things he did in connection with this matter. One of my principal weaknesses, as far as I know myself, is that it is very hard for me to say “No,” especially to brethren I love as much as I do all the members of the Board, including the brethren newly appointed; in fact, all who are truly the Lord’s. When signing the resolution, I had strong hopes that reconciliation might be made between the two parties who differed, and that neither publication of the resolution nor any other publication from either side might be necessary. Before I signed, however a number of statements to which I objected were stricken out. After being thus modified, it was further agreed that copies of this resolution should be set only to Classes and brethren that had heard of the trouble and requested an explanation. I held out for some hours against a thing I did not believe in, but since the brethren had changed it, eliminating some objectionable paragraphs, and agreeing to send it only to inquiring friends, I finally signed, as a compromise. When our Secretary showed me a copy of the resolution which had been sent to the Class, I could not help but think that it had been sent far and wide to all Classes; and I felt that I had not taken the proper course in signing even after it had been amended. Now that I have reason to believe a general circulation of this resolution has been made, I want to assure you that had I foreseen this I should never had signed the paper. I feel that this had done you four brethren a decided injury, because, in my opinion, none of you has any desire to do any harm to the Society or bring about a division, but that you simply differ with Brother Rutherford about the control of the Society; that it is your desire to stand by the charter and the principles of Brother Russell, which recognize the Board of Directors as having the power of control. I have not concluded to take a firmer stand for what I believe is the right, viz., that the appointment of the new members to take the place of the four who were not legally members according to the decision of the Philadelphia law firm was not the proper course, and will therefore stand by the old Board. A copy of this letter goes to Brother Rutherford. P. S. You have my permission to make such use of this letter as you may deem wise. New York, July 23, 1917. You have requested our opinion concerning your present title to office as Directors of the Watch Tower Bible and Tract Society, and concerning the views as to the law expressed by Mr. Rutherford in his “Statements of Facts and Points,” a copy of which you have received. If this be so, it goes without saying that the courts of the State of New York have ample jurisdiction to see to it that the affairs of the corporation, which, according to Mr. Rutherford’s own admission, are being conducted almost entirely within the State of New York, are not taken out of the hands of a majority of its Board of Directors and turned over to other men whom the President chooses to appoint and regard as Directors. No lawyer familiar with the New York law would have any difficulty in finding legal methods of preventing the usurpers from exercising control over the affairs of the corporation in this State. The second proposition in Mr. Rutherford’s “Statements,” to-wit, that the affairs of the corporation could not be brought before the courts in the State of New York, because it is no registered in this State, would involve, if true, very disastrous consequences for the corporation, in view of Mr. Rutherford’s own admission that all of its affairs are being substantially transacted in this State. If, in truth, it be an outlaw here — if, in truth, its affairs are not under the protection of the State of New York — it is easy to see that the corollary of the proposition that it is not competent to be sued in the courts of this Sate, is that for the same reason it is not competent to sue, and that in consequence its affairs, its disregard of the constituted Board of Directors, whose presence in office had expressed the will of Pastor Russell and of the membership of the corporation for years. Pastor Russell, therefore, was not so ill advised as to the law, that in conducting the affairs of the corporation in this State since 1909 (as Mr. Rutherford himself says) he committed the mistake of placing those affairs outside of the protection of courts of justice. The third proposition made by Mr. Rutherford is that the provision in the charter of the Watch Tower Bible and Tract Society, approved in 1884 and still incorporated in the said charter, that “the members of the Board of Directors shall hold their respective offices for life,” is invalid, since the statute of the State of Pennsylvania, providing that Directors shall be chosen annually by the stockholders or members, is said to be applicable to this corporation. It is a little surprising that one who for years was connected with the management of this corporation should not have discovered this alleged illegality until after the death of Pastor Russell, and then for the first time should bring forward a claim which is well calculated to subvert the whole scheme of government as planned and desired by Pastor Russell, and should use that claim to justify the possession of power in himself alone to oust a majority of the Board of Directors and to fill their places, notwithstanding that a number of the persons whom he thus seeks to exclude held that office for years with the acquiescence and approval both of Pastor Russell and of the membership of the corporation. In this connection it is significant that the charter of the Society is endorsed, as required by Pennsylvania law, with a certificate of an Associate Judge of the Common Please that such judge had examined the charter and found the same “to be lawful and not injurious to the community,” and that therefore the incorporators and their associates were entitled to have leave to be a corporation for the purposes and upon the terms therein stated. Even if, however, an election or appointment “for life” could not lawfully be made, your right to office would not be in any way affected, since no successors to you have been chosen by the members of the corporation. Assuming, for the sake of argument, that as Mr. Rutherford claims, the Pennsylvania statutory provision that “Directors shall be chosen annually by the stockholders or members,” has some application to this corporation, there would then come into play the very next clause in the statute, to wit, that such Directors or Trustees “shall hold their office until others are chosen and qualified in their stead.” As the members of the corporation have never chosen anyone in your place, your terms of office would (if the statute cited by Mr. Rutherford were applicable) be extended beyond the expiration of one year until such time as successors chosen, not by Mr. Rutherford, but by the members of the corporation, should qualify. Even if the term for which you had been elected were longer than the law allowed, you would not thereby be disqualified from holding office during the lawful period. Furthermore, this provision of statute that Directors do not lose office solely because of the failure of the members of the corporation to appoint their successors, but continue until such time as the successors have been appointed and qualify, is merely expressive of the common law rule on the subject, and hence would be applicable to your case, even though the statute which we have been discussing be not applicable to the corporation. As to the claim that at least three Directors must be residents of the State of Pennsylvania, it would seem to be enough to reply that if this be so, the defect in title to office would apply to the entire Board of Directors and not merely to such individual members thereof as Mr. Rutherford (not himself a resident of Pennsylvania) might choose to consider affected by such disqualification. We are, however, unable to find any provision of Pennsylvania law enacted when this charter was adopted or which affects this charter which makes it mandatory that a certain number of Directors in a membership corporation (as is this one) shall be residents of the State of Pennsylvania. As to the claim that Mr. Rutherford, as President, is “the executive officer and General Manager” of the corporation, and as such “has the legal right to manage the corporation,” we cannot but feel that the conclusion which is sought to be reached from the development of this claim, to wit, that as “Manager” he may fill the Board of Directors with his own appointees, is founded on the use of the word “Manager” in a double sense. 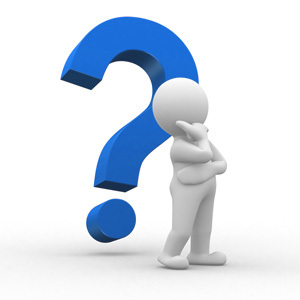 The term “Manager” of a corporation is the title of an office thoroughly well known to the law and in the business community; and it has never been thought before that this office was in any way connected with the appointed of Directors. It has to do solely with the executive management, and the Manager is the representative and executive officer of the Directors and not the overlord or source of power. The argument that the incumbent of the office of Manager has the “legal right to manage the corporation” is of course unsound, if the word “manage” is meant to imply the exercise of all the powers of the corporation, including the right to appoint Directors. As to the filling of vacancies, it is enough to say that if Mr. Rutherford is right in his contention that certain portions of the charter are invalid because of the statute laws of Pennsylvania as to corporations, then he is wrong in his contention that as President or Manager of the Society he has the right to fill vacancies, because this statute expressly provides that “in case of the death, removal or resignation of the President or any of the Directors, Treasurer or other officer of any such company, the remaining Directors may supply the vacancy thus created, until the next election.” Furthermore, even aside from this statute and taking the charter solely by itself, he has no right to fill your places, since “vacancies” have not occurred in your respective offices, and also because in the event of any such vacancy it would have been his duty, or the duty of any other president, to call the Board together in special meeting, and he could not deprive the Board of such power and obtain it for himself merely by failing to call a special meeting for such purpose. But even if for any reason your original title to office might have legal defects, you, or at least three of you, have been in office so long and your title to office has been so long recognized by the entire membership of the corporation and by its late President, that you are no de facto Directors, even if not de jure Directors. Finally, it is important to observe that if the provision of the Pennsylvania statute that directors shall be chosen annually, had the effect which Mr. Rutherford claims, to wit: as rendering vacant the office of every director at the end of one year, he himself would have no title to his office as director or as President, for the charter requires that the President “shall be chosen from among the members of the Board annually.” Mr. Rutherford claims that because he was elected by the members of the corporation to be President, such election constituted impliedly an election of him as a director, although he was not expressly so elected. This claim has been overruled by our Court of Appeals in a similar case (People ex rel Nicholl vs. New York Infant Asylum, 122 N. Y. 190.) If he were not in fact a director, the mistake of the members of the corporation in supposing that he was already a director and therefore eligible to be President, would not render him eligible in law to be president or constitute him a lawfully elected director. For this and other reasons, we are of the opinion that he propositions of law advance by Mr. Rutherford, would, if sound and pushed to their logical conclusion, defeat his own title to office as director and president. Please address us P. O. Box No. 179, Brooklyn, N. Y. A situation of such seriousness has arisen in the management of the Watch Tower Bible and Tract Society that we, writing to you as a majority of the Board of Directors, have felt it necessary that you should be acquainted with the facts. The point, in brief, is that an effort is being made to change the scheme of government of the Society as Brother Russell himself devised it and desired it to be perpetuated; and, to that end, to declare illegal provisions in the Charter of the Society which Brother Russell himself placed there, and to use this claim of illegality to oust Directors who have held office for many years with the approval of Brother Russell and the Society. J. D. Wright, who is one of those now writing you, became a Director in 1906; I. F. Hoskins became a Director in 1908; A. I. Ritchie became a Director in 1911, and R. H. Hirsh became a Director on March 29, 1917. We four are a majority of the seven Directors of the Board. A. I. Ritchie was Vice-President of the Society at the time Brother Russell died; and Brother Russell’s Will appointed R. H. Hirsh and I. F: Hoskins, with three others, “as possibly amongst the most suitable from which to fill vacancies in the Editorial Committee” of The Watch Tower. Obviously, these special reasons for Brother Russell’s personal conduct of the affairs of the Society do not hold good in the case of any other person. Since Brother Russell’s death, Brother Rutherford has for the first time declared that this scheme of government by Directors who are to hold office for life, is illegal under the Laws of the State of. Pennsylvania, and that directors can lawfully hold office only for-one year. He has also for the first time declared that under the jaws of the State of Pennsylvania at least three of the Directors must be residents of the State of Pennsylvania. With these claims as a lever, he has undertaken to say that we who are now writing you are not lawfully directors of the Watch_ Tower Bible and Tract Society, and that he has authority to appoint other directors in our place; and he claims to have done so, naming four brethren, none of Whom was a Director of the Society during the life time of Brother Russell. He also undertakes to say that, in view of his assertion that the law of Pennsylvania requires three directors to be residents of that State, the penalties of non-compliance with such supposed requirements shall fall upon us, rather than upon him and the other Directors, although neither he nor Brother Pierson nor- Brother Van Amburgh is a resident of the State of Pennsylvania. On the other hand, the undersigned, Brother Hirsh, has his home in the State of Pennsylvania. We are advised by our counsel, Messrs. Davies, Auerbach & Cornell, of 34 Nassau Street, New York City, that the claims of Brother Rutherford in these respects are entirely without warrant; that we are lawfully Directors of the Society; that those whom Brother Rutherford has undertaken to appoint in our places have no title to office; and that if the claims of Brother Rutherford were sound in law, he could have no legal title to office either, as a director or as president. We annex a copy of counsel’s opinion. What concerns us most, however, is not the legal or technical rights of the matter, but rather the sacred necessity of preserving the scheme of government laid down for the Society by Brother Russell himself and of preserving in the Society faithful loyalty to each and all of the provisions of the Charter and of his Will concerning this Society, quite irrespective of ‘legal technicalities. That scheme of government was very simple and has well performed its purposes through the years. It has, without exception, met with approval from the membership of the Society; and no one has heretofore thought or attempted to upset it by raising legal questions. It seems to us, therefore, to be a matter of the gravest concern that, after Brother Russell’s death, one holding a high position in the Society should undertake to expunge from the Charter, on technical grounds, provisions which Brother Russell himself put there, and which the experience of years has justified; and should undertake, through his mere declaration that such provisions are invalid (contrary to the opinion of counsel), to draw to himself complete power in the selection of the members of the Board and to appoint new men of his own choice in the place of those who served for years with the approval and at the wish of Brother Russell. At the time when this article was written Brother Rutherford was one of the Editorial Committee and must have passed upon its composition. 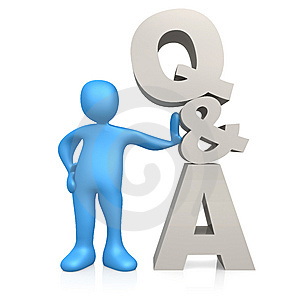 We feel it our duty, therefore, to lay all the foregoing facts before you and to ask for your advice and guidance. We would not willingly, in our own private interests, take even defensive measures; but we are bound to realize that we are in a very high sense fiduciaries who are charged with the duty of preserving, whole and unbroken, the traditions of the Society and the provisions by which Brother Russell desired it to be governed during his life and after his death. Under these circumstances it seems to us clear that the moral influence ‘of all the brethren should immediately be brought to bear, in order that what we conceive to be these injuries to the fabric o f our beloved Society may be repaired from within; and that thereby means may be found to avert what otherwise will be the lamentable certainty of litigation in the courts. Further Note: — On Friday, July 27, Brother Rutherford, representing the Peoples Pulpit Association, ordered the above named brethren to leave the Bethel Home.